Columbia, Mo. 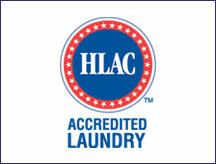 — The Columbia branch of Linen King was recently accredited by The Healthcare Laundry Accreditation Council (HLAC). This accreditation is the industry’s highest rating on quality and safety. Linen King is currently in the process of scheduling certification inspections for its remaining locations and plans to complete the process in 2014 as HLAC inspectors are available.